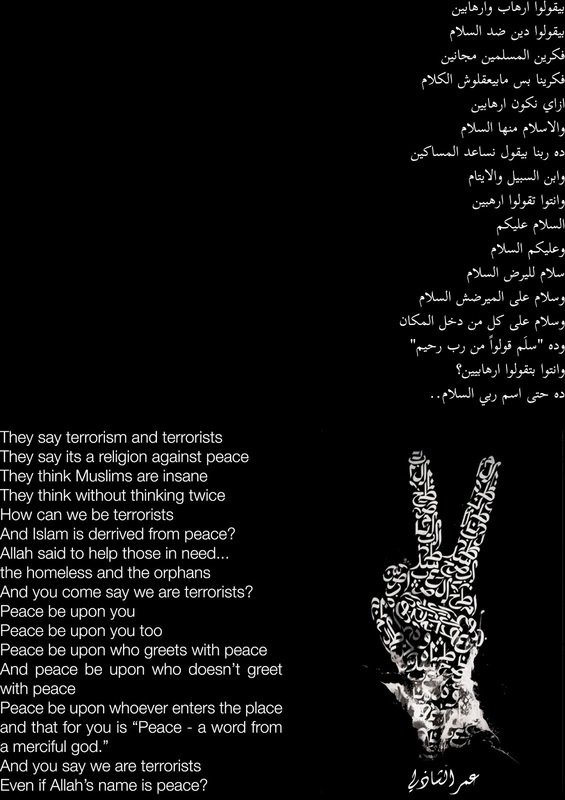 وده "سلَم قولواً من رب رحيم"
Peace and Islam two words that don’t quite work together nowadays, due to many false stereotypes. Many non-Muslims view Islam as a complicated religion that is full of violence, closed minded worshipers and people who blindly go against peace. With the rise of terrorist attacks all over the world there are no other people to blame but Muslims. A misconception that has been around for ages and does not seem to be going anywhere any times soon, making our world and specifically Islam a nightmare. As a matter of fact, Islam is a religion that encourages peace and serenity, completely contradicting what the media is stereotyping which is terror and violence. “Islam” is derived from the word “salam” in Arabic, which means peace. In addition, the word “Islam” means no harm, which is basically the definition of peace. O ye who believe! Enter into Islam whole-heartedly; and follow not the footsteps of the evil one; for he is to you an avowed enemy. For my art project I chose to write a poem that would kill and go against the stereotypes. My idea was to validate that Islam is a religion of peace and it is not about terrorism nor violence. The poem is called “They say” or “بيقولوا” I chose this name because I mention the stereotypes that non-Muslims say about us and what the media spreads amongst us as people. In addition, I add to what they say about Muslims (which vary from us being terrorists to us being violent and crazy) a lot of explanations to why we are not what they think we are. These explanations don't only come from the word Islam that derived from peace as explained earlier, however, they also come from Hadiths from the Prophet Mohammed (PBUH) and sayings from the Quran. "Peace!" - a word (of salutation) from a Lord Most Merciful! The message that I wanted to get across from my poem is that the stereotypes that are shown through false media nowadays are all not true. Actions of extremists that are displayed daily should not be taken as a general idea about Muslim people. On the contrary, Islam is a religion of peace and serenity and that is what the world needs to understand.